XML or eXtensible Markup Language is widely used to store or interchange data on internet. XML is derived from SGML and is human and machine readable. XML document can have custom defined tags. In a previous article we discussed how to generate xml using php , this article explore how to parse XML using NodeJS. Suppose you are working on an online book store application, and this application shares all available books information. You can generate a XML document containing information such as book name, category, price and author etc. This information can be parsed and displayed to users by other web sites. Open command prompt and type following command to generate a NodeJS, Express application. This command will generate an express application named nodejs-parse-xml. Type command cd nodejs-parse-xml. Type npm install to install the dependencies and modules. You can see the directory structure. pug is used as template engine. The XML file below is used to store information about the books. Create a directory xmlfiles in public directory. Create an XML file booksxml.xml with following information. In the document bookstore is the root element. This element contains book elements. Each book elements has information about a book like name, author, price, category and year. Open index.js file in routes folder and add the code below in the file. As you can see we have included fs and xml2js module . Next a parser is created to parse XML document. In ‘/’ route first define path of the file to be parsed. fs.readfile method takes three parameters. First path to file to read, second the encoding type and last a callback function. Callback function returns contents on file in text variable. Callback function parses XML from text variable using parser ‘s parseString method. books variable contains all the books information in bookstore root element. index view template is rendered and books variable is passed to view template. Open style.css file inside stylesheets folder present in public folder. Add following code in style.css for table, tr, th, and td. 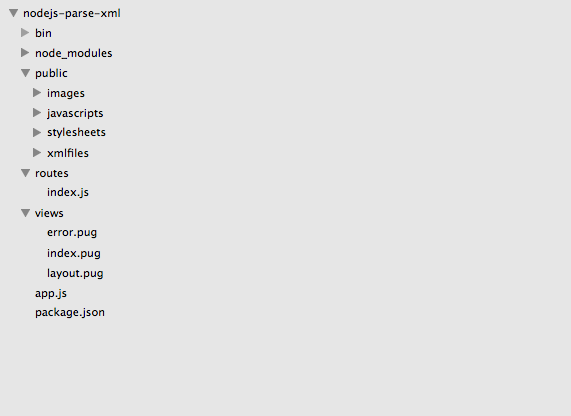 Open index.pug in views folder and add following code to display information from XML file. In the view file a table is created with headers Title, Category, Author, Year, Price and Language. Next we loop through a books information, displaying category, author and price. Title element that contains an attribute for language and value of book title are parsed differently. To display title “_” is used to display column value. To display attribute lang. $ is used with lang parameter to displays value of language attribute. You can see the parsed XML result in the image below. In this tutorial you learned how to parse XML using NodeJS and display this information to user. You can download the source code for this tutorial. Please leave you feedback and comments. Follow us on twitter or subscribe to our newsletter to stay informed about upcoming tutorials and articles.